You can count the fluffernutter sandwich among Paul Revere’s many descendants along with Tony award-winning actress Anne Revere and Civil War Gen. Joseph Warren Revere. The classic New England kids’ treat was the brainchild of Paul Revere’s great-great-great-granddaughter Emma Curtis of Melrose, Mass. 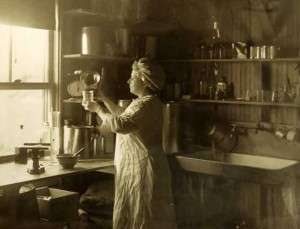 She and her brother Amory (Paul Revere’s great-great-great-grandson) began making and marketing Snowflake Marshmallow Crème in 1913. In the 1890s, Amory founded a company in Boston that sold soda fountain hardware, fruit extracts and syrups. He sold the company and in 1901 moved to the suburb of Melrose, looking for more room. Amory bought up the entire east side of Crystal Street and built a house at No. 17. Nine years later he began making marshmallow crème in his basement. It sold so well that in 1913 he built a factory down the side of the street he still owned. The Curtises didn’t invent the product. Several other companies sold something similar. But Emma Curtis found novel ways to popularize the sweet treat. She created new recipes that used marshmallow crème and printed them in small brochures. She promoted the recipes on a weekly radio show and in a newspaper column. By 1915, The Curtises were selling Snowflake Marshmallow Crème all over the country, but especially in New England. During World War I, Emma Curtis published a recipe for a peanut butter and marshmallow creme sandwich. 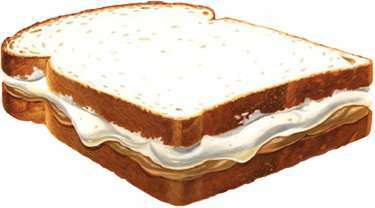 She called it the ‘Liberty Sandwich.’ Four years later, the Curtises introduced a marshmallow fluff, called SMAC Marshmallow, and printed the recipe for peanut-butter –and-SMAC sandwiches on the label. That is the earliest known example of a fluffernutter, according to Brigid Alverson, a Melrose historian. Emma Curtis died in 1948, the day before her 85th birthday. Amory, who was much younger, continued to run the company with a cousin until 1962. The business closed that year after arsonists burned down the Curtis Marshmallow Factory. 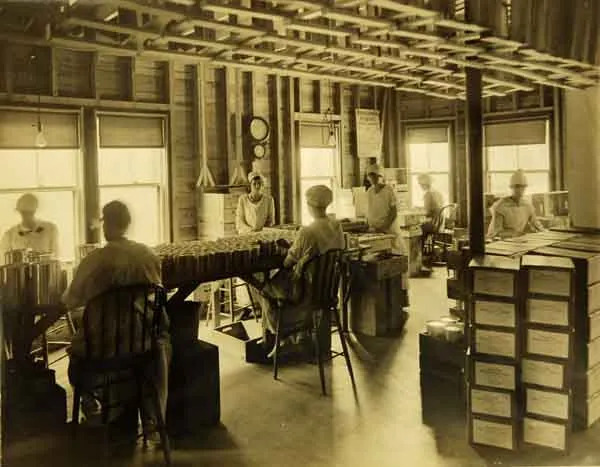 As the Curtises built, then wound down, their marshmallow crème business, another chapter in the fluffernutter story was being written just a few towns away in Massachusetts. Before World War II, a Somerville man named Archibald Query whipped up batches of marshmallow crème and sold them door-to-door. The gooey concoction was – and still is – made from sugar syrup, corn syrup, vanilla flavor and egg white. Durkee-Mower Inc. started off with a barrel of sugar and a secondhand Ford. They cooked at night and sold door-to-door – for $1 a gallon -- during the day. Soon they had plenty of customers and a factory in Swampscott. In 1929 they opened a state-of-the-art factory in Lynn, Mass. 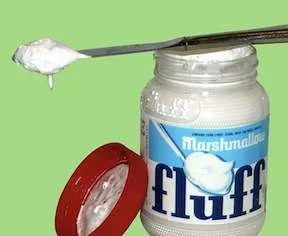 Like Emma Curtis, Durkee and Mower used innovative techniques to popularize Marshmallow Fluff. In the ‘30s they sponsored a radio show called the Flufferettes on the 21 stations of the Yankee Radio Network,. The Flufferettes came right before the Jack Benny Show and featured live music and comedy. The final episode featured the Yummy Book, which included recipes for cakes, pies, candies, frostings and – of course – the fluffernutter sandwich. It wasn’t called the fluffernutter sandwich, though, until 1960, when the Durkee-Mower advertising agency came up with the name ‘fluffernutter’ as a way to market the sandwich. It caught on, and today the fluffernutter is as much a part of New England cuisine as baked beans or Moxie soda. Durkee-Mower is still in business, still in Lynn and still selling Marshmallow Fluff through grocery stores and online. In 2006, Massachusetts state Sen. Jarrett Barrios filed a bill that would restrict the serving of fluffernutter sandwiches in schools. State Rep. Kathi-Ann Reinstein, who represented the district where Marshmallow Fluff is made, vowed to fight to the death for Fluff. Somerville now holds an annual festival called ‘What the Fluff?’ to celebrate Fluff and fluffernutter sandwiches. In 2011, astronaut Richard Michael Linnehan, who had eaten a fluffernutter sandwich aboard the International Space Station, was a contest judge. With thanks to The Melrose Mirror. This story was updated in 2018. A fluffernutter is ALWAYS on the menu at my house. Blew my mind when I first came south, most people have never heard of a fluffernutter. Now I have quite a few people hooked. I was so disappointed when I moved to Texas that Fluff was not available (as well as white tuna and top split hotdog rolls!). I had to settle for Marshmallow Creme. poor you – glad i live up here!! Wow. Never thought about Paul Revere’s relative would do something like this! One of the favorites in our house, I never knew this. Hubby and I have never heard of this! Intetesting. We can’t live without fluff! Kids’ treat?? I like it , too!! Fluffanutter and peanut butter sandwich! #1! I now live in England and am sharing the fluffernutter phenomena here… when I feel that horrid homesickness a fluffernutter… or a great glob of fluff in hot chocolate… really helps. So do tootsie pops but cant buy those here… a jar of fluff is about £6 … nearly $10! how can i share this?? Easy to share, just click on it and it will come to the article. Copy the link and paste it where you want to share it. It will open to the way you saw it.